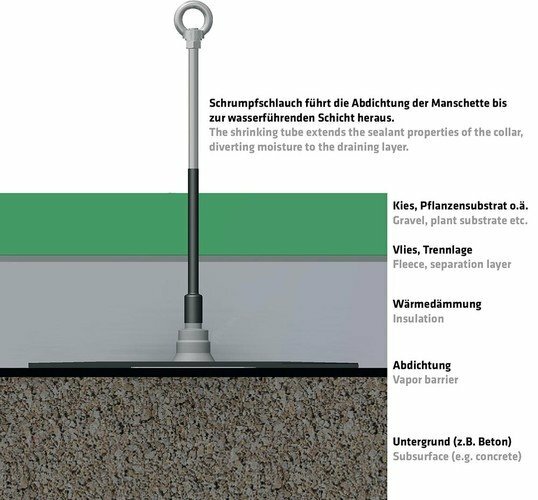 This sealant collar was designed for anchorage points with a diameter of 16 or 42 mm and is cold-bonded onto the subsurface. Special notches allow it to be flexibly shorted. 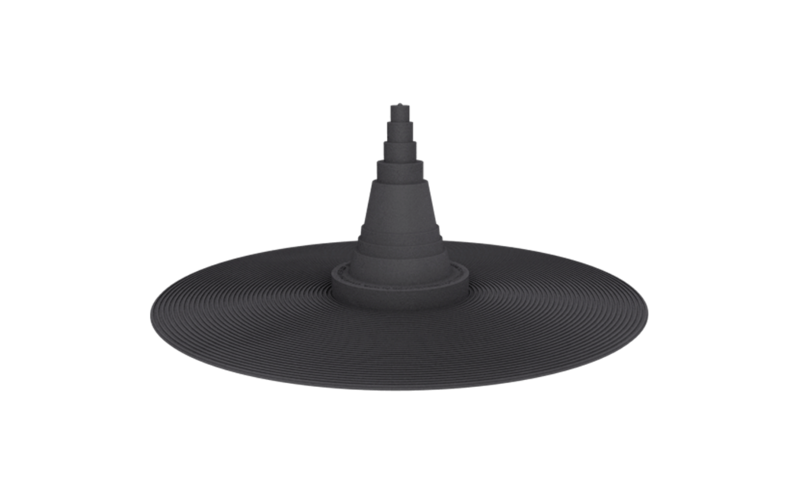 The disc of the collar is 420 mm in diameter. A tube clamp is included in the package. Use one of our ABS-LockSeal Basic collars to seal up an anchor or system support installed on your roof. 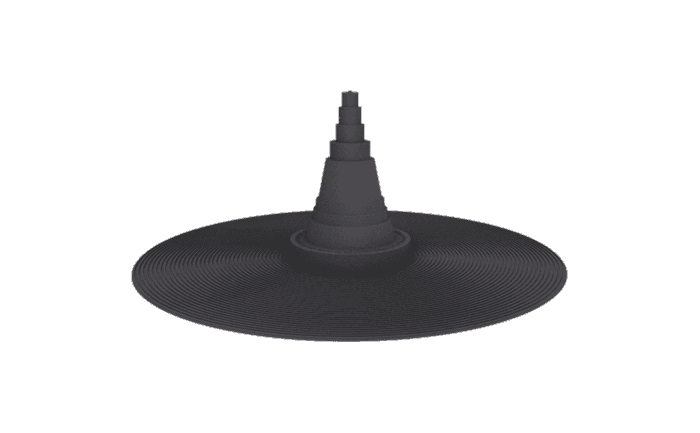 The disc is 420 mm in diameter and is simply cold-bonded onto the roof membrane. Our ABS-LockSeal Basic can either be fixed to the uppermost layer of your roof surface, e.g. on a corrugated roof, or integrated into the roof insulation. The shaft has various diameters so that it can be used both for 16 mm rods as well as for broader, 42 mm supporting tubes. The upper end of the collar shaft, through which your support is fed, can be sealed up in a variety of different ways. The first option is to simply seal up the end of the shaft using the tube clamp supplied. 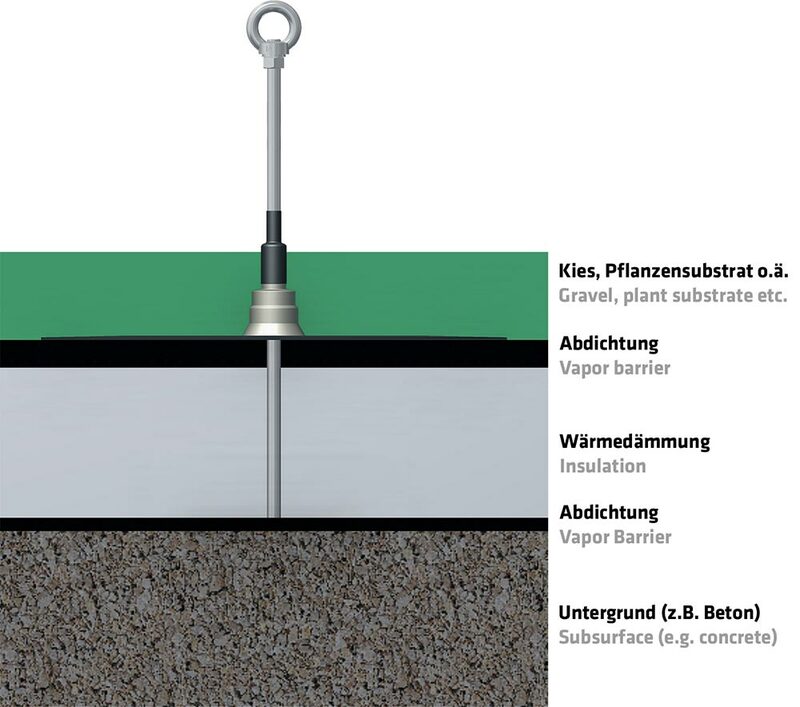 However, if you want to extend the length of the seal, for example, to lead it through your insulation material and up above the aquifer level, we can offer you a selection of extensions. Our ABS-LockSeal Extension is available in three different lengths: 300, 600 and 1200 mm. These shrink tubing extensions are simply placed over the protruding end of your existing sealant collar and then carefully heated up from top to bottom, e.g. using a hot air gun. The extension then shrinks for a permanent fit - water can no longer seep in. Our ABS-Lock Seal Basic is not suitable for sealing up EPDM membranes. However, our product portfolio contains a multitude of solutions for sealing up other types of roof surface. Feel free to contact our Sales Team, if you are not quite sure which sealant collar you need for your own particular project.